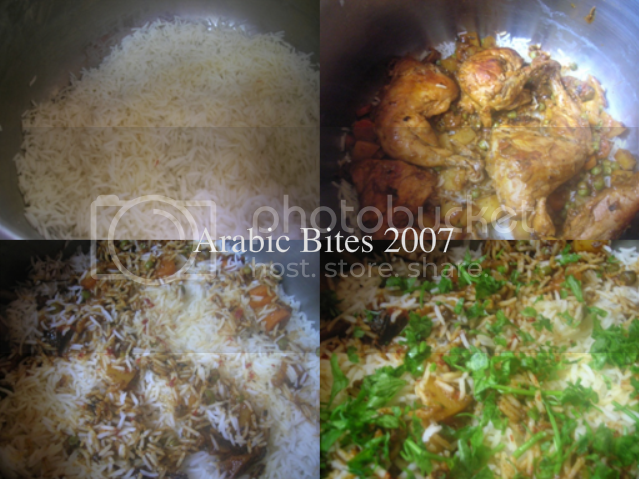 Arabic Gulf Cuisine is similar to Indian Cuisine with little difference in Spices. for example indian add alot of chilli and curry paste to biryani to make it hot ,but in arabic gulf we don't . 1 whole chicken cut to 4-6. 2 teaspoons grated fresh ginger. 1/4 cup fresh parsley or coriander, finely chopped. Pinch of saffron soaked in 1/4 cup rose water. 1)Sauté onion, with olive oil add garlic, ginger, whole spices, stir, cook 5 minutes. 2)Add chicken, salt, ground spices, stir, cook, until chicken brown, add chopped tomato, tomato paste, yogurt, water, and simmer cover, for 30 minutes. 3)In small pan shallow fray potato and carrot. 4)After 30 minutes add potato and carrot to the chicken mixture cooked for 5 minutes then add peas, cooked until all the vegetables are tender. 5)Make basmati rice:in a deep pan bring to boil water with 1 tablespoon salt, and 1 tablespoon oil, add basmati rice, and boil it for 8 minuets. Remove from heat and Rinse the rice from any excess water, put it back to the same pan. 6)In a deep pan cover the bottom with half the cooked rice and pour half of saffron and rose water mixture over the rice, then arrange chicken pieces and vegetables on top of rice, then cover it with the rest of rice, pour rose water all over the rice, sprinkle fresh parsley on top, cover with parchment paper and aluminum paper, bake in preheated oven 350 F for 20 to 25 minutes. 7)Serve it with cucumber and yogurt mint salad. Actually, our recipes are pretty much exactly like that too. We don't use any other spice either in our biryani! So, I don't think Indian biryani and Arabic biryani differs much. Just recently discovered your blog and I'm enjoying seeing what you're cooking. our Indian friend invited us once to her house and made us biryani,she actually blend 15 green chilli with onion,ginger and garlic and cook the chicken in this mixture,her biryani was very very hot .that why I said there is different between Indian biryani and Arabic biryani . I agree with you,I enjoy all of them too especially with buttermilk or Yogurt. 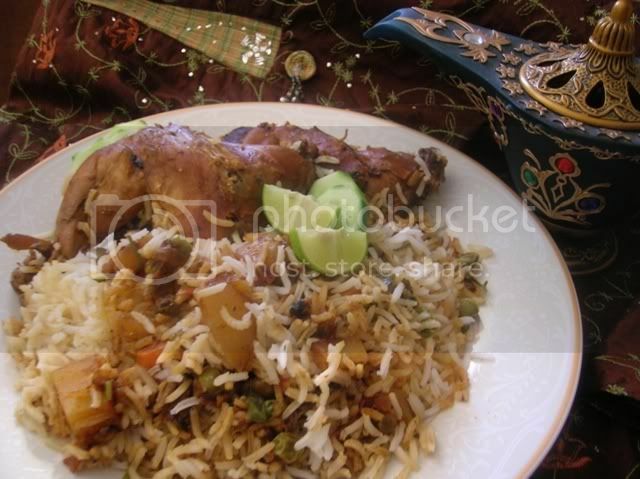 Your biryani luks very yummy...will definitely try it out..this is my blog do visit. Zainab and Meedo, Assalm Alaikkum..
Today only I found your blog.I love Arabic recipes a lot.Really wonderful recipes and pictures you have. will visit again insha Allah.. Thank you all (mona,sabita,Amy,seena)for the comment. mona what dose Asak mean? i lovvvvvvve your site. thank you thank you thank you thank you! very easy to use, with images, much fun. i visit you all the times. Hello,i was searching for a good arabic biriyani recipe and finally ifound ur site.its really great.can u please give me the recipe of garlic paste(dip).i love it very much. 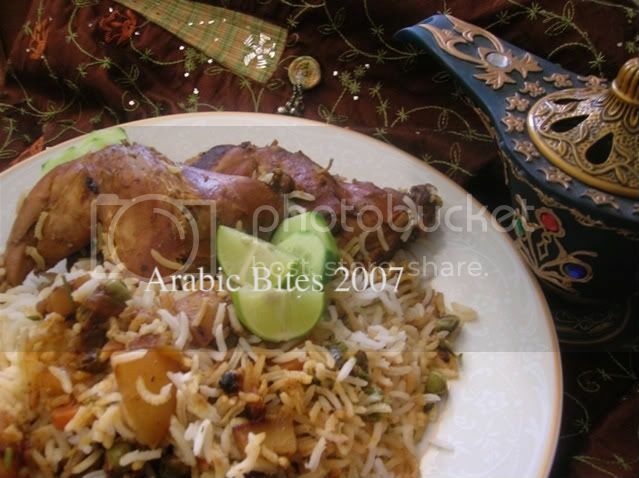 hello i was in search of a good recipe for arabic biriyani and finally got it from ur site.thank u.i m a great lover of arabic food.can u please send me the recipe of garlic paste. another great recipe. it turned out great. 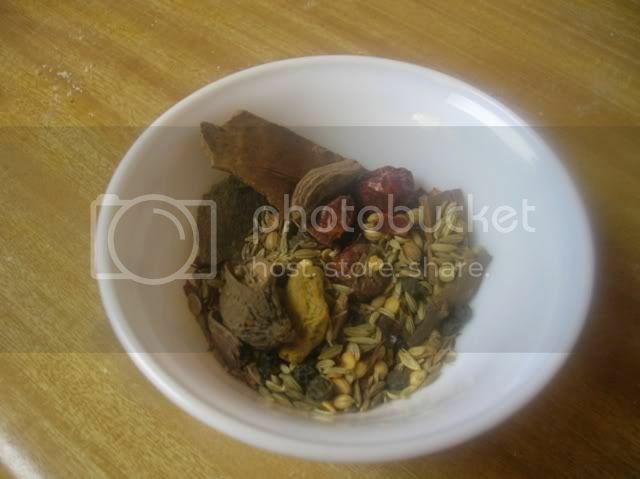 i've been wanting to try a birayni with out the "box" spice and this combo works out great without the heat.....my kids aren't screaming for water because its too hot :) I like the saffron and rose water with too. thanks again ladies! Thank you & keep visiting. If you mean "garlic paste" that use in biryani use this recipe here. & for "garlic dip" use Mayonnaise with garlic. I'm glad that the recipe work well for you. discovered your blog really enjoy your recipes. I discovered this blog by chance. Thank you so very much for the recipe..I've tried it and followed the recipe closely. I can assure you it is delicious..my husband loves it so much.It was my 1st attempt to cook Arabic chicken biryani, indian biryani many times before. God, i love this blog. Definitely will try the rest of the recipes.